The saga began about 12 hours earlier as Clyde and Griswald (do I even need to say it...) were driving back from Watkins Glen. As often happens around an event at that venue and others, people along the routes to and from will put out cars, motorcycles, lathes, boats, snowmobiles, chainsaws, tractors, motor homes, civil war canons, etc in the hopes of snagging a customer already swimming in a pool of his own testosterone. It is like fishing in a well-stocked pond; you barely need bait, any bright shiny object would do. Clyde was a fish trying to jump into the boat, ignoring the fisherman altogether. They had already stopped once to look at the saddest Cobra replica south of the arctic circle, and then he saw it. Griswald saw it too. Heck, the space shuttle could see it. 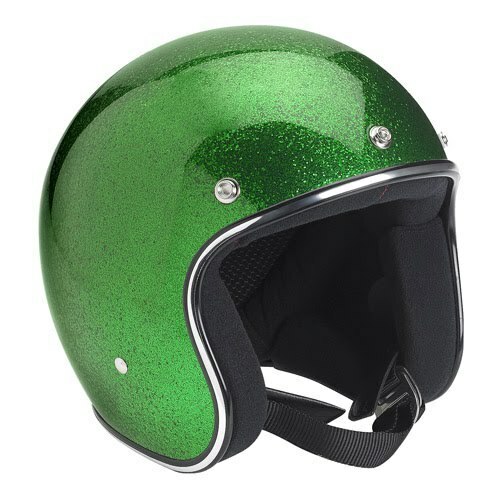 A bright candy green metal flake jewel of a gas tank. This was not the stock candy olive green that Honda made. No, this tank had been custom painted in the shiniest candy green metal flake paint known to man. it was surrounded by an otherwise mostly stock looking Honda CB750. At Clyde's loud sudden urgent insistence (read scream), Griswald threw out the anchor and made a u-turn. Clyde regained his composure and walked over to the bike. He circled appreciatively. He nodded appreciatively. He stroked his chin and pointed at it, as if I might not be sure what he was admiring. It had all the hallmarks of a bike that had been sitting a long time. Seat split in the way that only dry rot can produce, pitted chrome, and new tires since the old ones had obviously crumbled to dust. "Sure, go ahead" the Porch said. Still no movement. Clyde turned on the petcocks, set the choke, turned the key which was in it, and thumbed the starter. There was an instant healthy growl from the inline four. Clyde pursed his lips and nodded some more. "Take it for a ride" the Porch yelled. Clyde grinned, climbed aboard, snicked it into gear, and rode off down the road. It sounded good. Griswald waited by the car and the Porch was silent. It was a good 10 minutes. Clyde returned with a bigger version of the same grin. He turned off the bike and turned to Griswald. "I thought you were looking at cars?" "Looks cool, sounds cool, is the price cool?" "I've got something to show you" yelled the Porch. Time to reel him in. Clyde wandered over to the Porch and they went inside. A few minutes later he emerged with a matching green helmet and a title. "I'm riding it home, I'll just follow you" Clyde had made up his mind. "We are 150 miles from home and this thing has only been out of the barn for about 150 minutes. Let's come back with the pickup." Griswald made a valiant but useless attempt. "He said he changed the oil a few days ago and rode it to the Glen yesterday. It ran perfectly" Clyde walked to the car and grabbed his jacket. "I would ride that thing to Mexico right now" the Porch yelled. An hour and a half later, in the dark, Clyde was far from Mexico, and far from home. The green tank sparkled brilliantly when lit by the passing vehicles. The seat had split in many more places, and strips of vinyl had been blowing around like streamers for miles. It was colder than he thought without gloves, and the headlight went off for a few seconds every now and then. Not fun. The float bowls on the CB750 are not easily accessible in a well lit shop, much less the side of the road in the dark. After getting the two outer ones drained, Clyde tried starting the bike again as the trucks whizzed past. It sputtered to life, and he got another quarter of a mile before it died. Griswald finally pulled up after circling back around, and they rope towed the bike to the next exit which fortunately had a truck stop. Customers and workers alike commented on the beautiful green tank. An hour and some fuel hose later, they had it running rough, and suspected plugs. Clyde stayed while Griswald went for his pickup.